The 2018 Tula Rashifal foretells that they are mixed signals for the Tula natives in 2018. There are times when love would work best for them and in some cases some might feel neglected. Their career ambitions would however come to pass as they would highly likely succeed this year. Their health would also be at its best in 2018. Therefore, Tula Rashi need to make the best of this season while their mental and physical wellness permits them to. 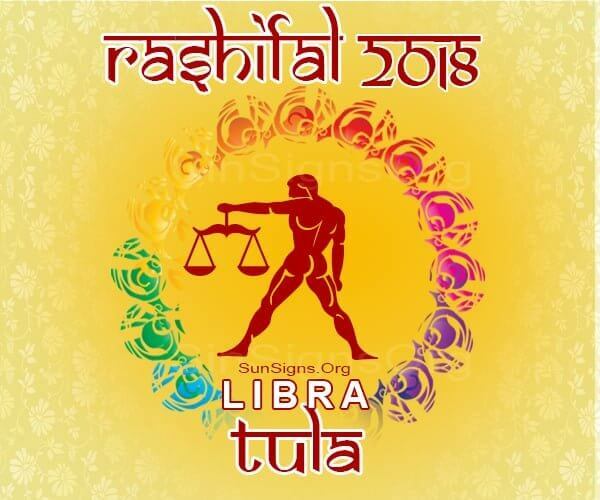 The 2018 Rashifal predicts that the career of the Tula Rasi would not be a major concern in 2018. This is because you will find it easy to earn a name for yourself. Things would seem to fall into place. This is something that would make the entire year worth going through. People would keep praising you for the good job you are doing. All this renews the energy you have in store to aspire for more. You never seem to stop when it comes to exploiting an opportunity that presents itself to you. The Bhavishya Jyotish 2018 astrology for Tula Rashi foretells that you career would be doing well. There is no doubt that your finances would also reflect on this. Right from the beginning of the year, you would garner the feeling of being successful all year long. Undeniably, this would be a good way to kick start the year. Also, there are big spending habits likely to be experienced in your travels. This is an area you would have to be careful about. Luxurious assets are also among the good predictions that Tula Rasifal 2018 foretells. Among them, there is a good chance for a new home or a new car you have been dreaming about. Your budget would have to be planned accordingly to guarantee that all these fit in appropriately. With regards to love, mixed reactions are expected in 2018 for the Tula Rashi. Your emotional aloofness would come in the way of successful affairs in your life. This is an attribute that would hurt those that are close to you. If you are married, you ought to take caution to ensure that this does not end up breaking up your union. If you are planning to have a baby, think twice before you do it. For Tula natives that are single, it might become a huge task to find true love along the way. This is because your emotional nature would invite a series of misunderstandings in your love affairs. Those that would be able to get past this would easily settle down and get married before the year elapses. Just like the previous year, 2018 Tula Rashiphal promises a year with minimal health issues. This is good news for you as you would have the energy to approach the year on a positive note right from the beginning. Certainly, this does not mean that you do away with your exercise routine. In fact, it calls for extra hard work to ensure that your health ambitions are attained. This is a good year for the Tula people to travel. Moving from one place to another would prove to be an exciting experience for you. This is because you would be taking the opportunity to meet new people and make friends with them. Your life would also go through a change as you might be adopting some of the cultures you would be experiencing as you travel. With all good things working in your favor, there is a good reason why 2018 should be anticipated by the Tula Rashi. Your emotions need some polishing to guarantee that you are among those who would be happy to experience the love that this year has to offer. The 2018 Rashi horoscope forecasts that compromise and mutual understanding, for example, would be required for blissful relationships in 2018.